The class was prompted to choose an area that we were interested in, in reference to the Roadmap's plan and goals. A few of us thought that promoting local businesses would be interesting and quite a challenge, so we began our research and our process. This is a visualization of our project's process, briefly describing the steps we took. We first looked into what the start-up culture is like in Pittsburgh and how that's different from the main street businesses. I researched articles on what resources exist for start-ups in Pittsburgh and the definition of a start-up. Then to narrow it down even further, we tried reaching out to local, small immigrant businesses. Using the Google form we created as a tool, I visited immigrant businesses around Carnegie Mellon University to ask for 5-10 minute interviews or to ask them to fill out a questionnaire online. We got in touch with the University of Pittsburgh's Small Business Development Center, the Urban Redevelopment Authority, New Sun Rising, and the City Council to understand the city's current state. We didn't get much feedback from the immigrant businesses, so we needed to think of another user base to collaborate with. With our professors' suggestions, we went out to different neighborhoods in Pittsburgh such as Allentown and Wilkensburg, to simply talk to people and see if they would be interested in promoting the local businesses in an innovative and inclusive way. Allentown was more responsive so we decided to work with them. In order for the local small business district in Allentown to succeed, we hypothesized that businesses need to increase their engagement with Allentown residents. Our goal was to create a product or service that would increase the businesses' engagement with Allentown's senior citizens. We decided to test this hypothesis with a specific population in Allentown, senior citizens aged 60 and older, because elderly residents make up a substantial proportion of Allentown's population. These are the groups of people we kept in contact with throughout the process. Notable people we talked to consistently in Allentown are Sienna Kane from the Hilltop Alliance, Cyndie C. from the Senior Center and the seniors at the Senior Center. I talked to Cyndie, Work Hard Pittsburgh, and Sienna Kane. Below, I visualized a stakeholder map using Illustrator. A large portion of research is going out to the field and talking to people, not just reading about them so our team went to a small business meeting, called together by Sienna Kane. We took this opportunity to talk to some businesses and ask how they've been running things and some of their biggest challenges. I talked to a few business owners and asked them about how they've been managing their business and some of their biggest challenges. To get feedback from the senior citizens, we sent out cultural probes in the form of postcards and graffiti walls (click to enlarge). These are insights taken from talking to various stakeholders. Since this course was about understanding policy and design, our research not only consisted of talking to seniors and local businesses, but also current policies that are affecting the businesses. City Council District 3 doesn't maintain a large staff focused on community development and small business promotion, so the majority of the long term community development projects are handled through community partners such as the Hilltop Alliance. The City receives funding from the federal gov in the form of the Community Development Block Grant Program and allocates this money to the Hilltop Alliance. In 2016, the Hilltop Alliance was provided with $40,000 through this grant program. The Urban Redevelopment Authority also provides funding to the Hilltop Alliance for initiatives related to small businesses in Allentown, such as the rent abatement program. In 2012, the City partnered with PennDOT and other transit organizations to renovate the E Warrington Ave business district. They constructed handicap accessible curbs and ramps, and re-paved the sidewalks with asphalt. In addition, bus routes were created to better connect Allentown with the rest of Pittsburgh. Municipal government does not get in the way of businesses and the services they would like to provide, even if certain services may not appeal to a large portion of the population where the businesses are located. After the interviews and research, our team took time to brainstorm what kind of ways we can help the businesses promote themselves to the senior population. We first thought about a concept called time banking. 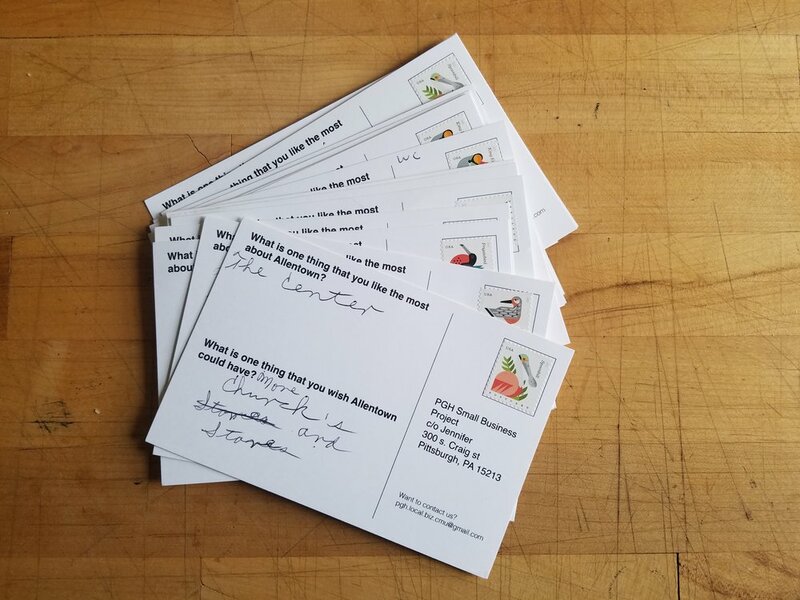 We thought it might be effective in Allentown if there was a way to understand the businesses' needs and services that the seniors can offer. Using the graffiti walls, we wanted to see if the services that the seniors can provide would align with the services that the businesses would be interested. However, the graffiti walls showed that there is not enough interest in the same types of things/services so time banking wouldn't be a good solution for the area. The program would be introduced to the small businesses through a Chamber of Commerce. ABOUT: This pilot presentation with Spool was a test for the program we’ve designed. We guided Michelle during her time of preparation, making sure she can make the most of the time she had. THE PRESENTATION: Michelle spoke about the monthly "maker nights" and $8/hour sewing machine access and assistance. She explained that Spool is a destination business but they also want to be accessible to the community. She acknowledged that Allentown is changing, but emphasized that the business owners want to include seniors. FEEDBACK: Using the feedback forms I created, we asked the seniors to fill out the questions regarding the business and the idea of having a pop-up shop. Some of the results from the forms we received were that half of the seniors who were present have never heard of Spool, none have visited, everyone enjoyed the pop-up and most said they would attend another. INSIGHTS: This event seemed to validate that the seniors don't know about or visit the new businesses on Warrington Ave and Allentown's seniors feel like they don't get much attention, but would like to engage with their community more. After conducting the pilot, there were a few next steps we thought of that Allentown might be able to carry out. As a part of the next steps, new policy would need to be in place–these policy recommendations from our team can potentially help the businesses not just in Allentown, but in other Pittsburgh neighborhoods as well. Create a small business liaison position within City Council District 3: This would include building relationships between the local government and the small business communities in the neighborhoods that make up Pittsburgh's 3rd District, including Allentown, providing financial and entrepreneurial guidance to current and future small business owners in Allentown, and fostering communication between the residents and the council regarding business district accessibility and revitalization. Implement the Small Business Administration's "Encore Entrepreneur" program: "Encore Entrepreneurs" is a joint effort of the Small Business Administration and the American Association of Retired Persons to empower citizens aged 50 and older to open small businesses. Allentown's community would be a good fit for an "Encore Entrepreneur" program. It would help build Allentown's business community while directly involving the neighborhood's seniors. Fast-track the creation of an official business district community in Allentown: This could be headed by the Urban Redevelopment Authority and the Hilltop Alliance. The business district community would work as a network for potential small business entrepreneurs interested in Allentown once the Hilltop Alliance's funding ends. 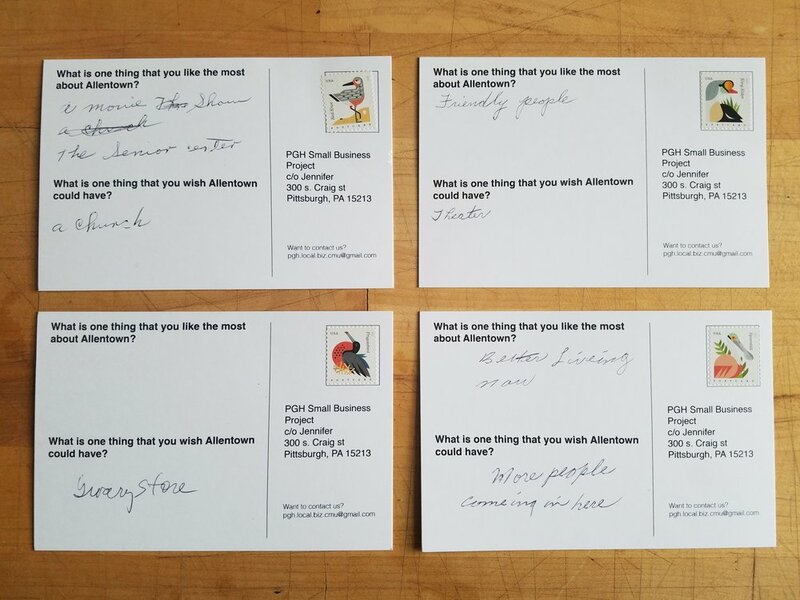 The community would also create Allentown-specific events involving the businesses in order to attract local residents as well as the wider Pittsburgh community to the neighborhood. As a conclusion of the class, my team created posters and a website that would guide business owners through the steps of our program. I designed the website. Here's a link to the InVision prototype for an iPad: https://invis.io/TAAR7TBZ7#/221075619_SeniorSpecialWeb-13.